Opera Rara’s fascinating journey into the forgotten treasures of the 19th century operatic repertoire. 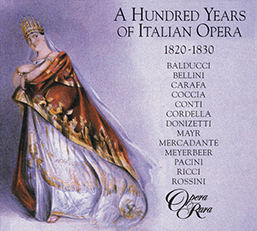 Opera Rara’s fascinating journey into the forgotten treasures of the 19th century operatic repertoire. 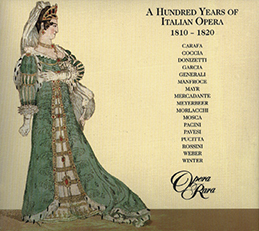 The second volume in Opera Raras continuing survey of Italian opera features arias and ensembles from the operas of Donizetti, Rossini, Mercadante, Meyerbeer, Coccia, Pacini, Manfroce, Carafa and others. 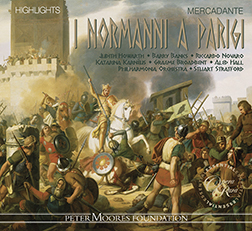 Andrea Bolton, Maria Bovino, Eiddwen Harrhy, Marilyn Hill Smith, Yvonne Kenny, Bronwen Mills, Susan Bickley, Della Jones, Anne Mason, Diana Montague, Myrna Moreno, Penelope Walker, Phillip Doghan, Kevin John, Robin Leggate, Chris Merritt, Harry Nicoll, Paul Nilon, Jonathan Best, Phillip Guy Bromley, John Cashmore, Geoffrey Dolton, Christian du Plessis, Russell Smythe, Geoffrey Mitchell Choir, Philharmonia Orchestra, David Parry, conductor. 03 Il trionfo di Quinto Fabio: Duet: Ah, per pieta, t’arresta! 06 La rosa bianca e la rosa rossa: Trio: Dov’e la destra? Infida! 13 Clotilde: Duet: Io servir! Oh avvilimento! 14 Ines de Castro: scena and Aria: Non paventar mia vita! 20 Enrico di Borgogna, Act I: Recitative and Aria: Elisa! Elisa! Oh! Me infelice! ? Care aurette ? 24 L’apoteosi d’Ercole: Quartet: Ambo unite! ? Come palpiti cor mio! 25 Alfredo il grande: Romanza: Ov’e la bella vergine? 27 Gabriella di Vergy, Act II: Finale scena: Ah! Fermate ? Raoul!